Puppies are more than just companions; they’re part of the family. So when your puppy struggles with a sensitive stomach, you’ll do anything to help them feel better. Puppies often have more sensitive stomachs than adult dogs because their digestive and immune systems are still developing. Providing high-quality, easily digestible foods with balanced fibre levels can help your puppy feel their best. Puppies also are more prone to gastrointestinal parasite infections, so it is important to consult your vet if you suspect a problem. Could Your Puppy Have a Food Sensitivity? New data suggests that food sensitivity in puppies might be more common than previously thought.1,2 no matter how old your dog is, if your dog starts showing signs of food sensitivity, such as itching, sensitive skin, vomiting and other gastrointestinal issues, it might be time to consult your vet and rethink your dog’s diet. Many proteins can cause a sensitive stomach, and repeated exposure to a protein can increase the chances of developing hypersensitivity. It’s difficult to isolate the exact protein that prompts food sensitivity in a mixed diet with many ingredients, but a limited ingredient diet can help you narrow it down and reduce the likelihood of an upset stomach. Even if your puppy isn’t showing signs of food sensitivity, you might want to keep a nutritional history of what you feed your puppy. This way, if your puppy develops food sensitivity later in life, it’ll be easier to identify the problem. The NUTRO™ Company provides balanced nutrient levels to help your puppy grow healthy and strong. NUTRO™ Puppy Formulas use single animal protein sources (chicken or lamb) and easily digestible carbohydrate sources, such as whole brown rice and whole grain oatmeal, for puppies with sensitive stomachs. NUTRO™ Limited Ingredient Diet Puppy Lamb & Whole Brown Rice Formula also uses a novel animal protein sourced from Australian and New Zealand lamb to help reduce the likelihood of aggravating food sensitivities. 1 Favrot C, J Steffan, W Seewald and F Picco. 2009. A prospective study on the clinical features of chronic atopic dermatitis and its diagnosis. “Vet Derm” 21:23-31. 2 Picco F, E Zini, C Nett, C Naegeli, B Bigler, S Rufenacht, P Roosje, ME Ricklin Gutzwiller, S Wilhelm, J Pfister, E Meng and C Favrot. 2008. A prospective study on canine atopic dermatitis and food-induced allergic dermatitis in Switzerland. “Vet Dermatol” 19:150-155. 3 Verlinden A, M Hesta, S Millet and GPJ Janssens. 2006. Food allergy in dogs and cats: a review. “Crit Rev Food Sci Nutr” 46:259-273. 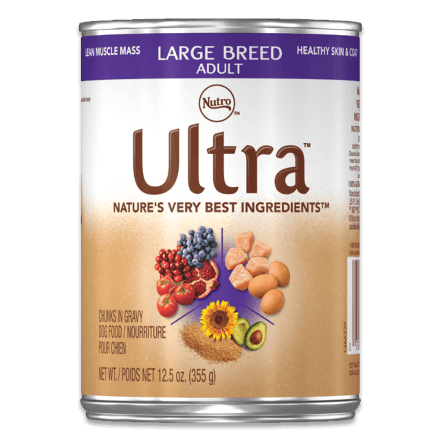 Many dog food brands do not feature whole grains. But whole grains in your dog’s diet help your dog stay healthy and happy.